Field planting typically begins in early May, or when all chance of frost has passed, and concludes by the end of June. Soil temperature in the production field should reach at least 65 degrees at a 4-inch depth for 4 consecutive days before transplanting. If the plants are set out too early, they may be injured by frost. Feeder roots of the transplant will not grow at soil temperatures below 65 degrees, and, if planted too early, vines develop a purple color, vigor will be reduced, root yield is low, and roots are round or chunky rather than oblong. The production field should be broken up with a moldboard plow and then disked. Silt or clay loams and sandy soils with hardpans are usually formed into wide, 8-to 10-inch high ridges with no turn rows to provide drainage. 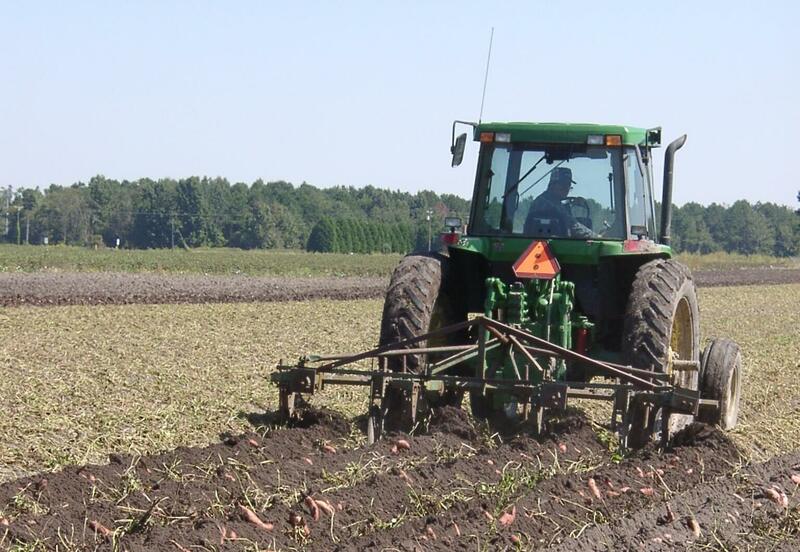 Rows are usually placed 32 to 42 inches apart with in-row spacings 10 to 12 inches apart for most culitvars. Beauregard, the most popular cultivar, should be planted 8 to 9 inches apart for improved yields and economic gain. Closer spacings delay harvest in most cultivars. A uniform stand of evenly spaced plants is important in producing high yields of No. 1 fresh market grade. Plants on both sides of a missing hill usually produce “jumbos” in the same amount of time that uniformly spaced plants are producing sweet potatoes of ideal sizes. The sweet potato plants (slips) are transplanted into the rows at a depth of 3 inches with no less than 2 plant nodes in the ground and leaving at least 2 leaves or more above the ground. Drag and precision types of transplanters may be used to plant the crop. Precision equipment spaces the plants uniformly but is hard to adjust when planting in soft, dry soil. (Supporting workers on seats mounted on a tool bar independent of the planting mechanism minimizes this problem). Drag equipment can be used in either wet or dry soils but provides little control over spacing of the plants. If water is provided at transplanting and as necessary for the next 40 days, the plants will probably survive later water stress. Thus, sweet potatoes are sometimes thought of as a drought-tolerant crop. In reality, however, sweet potatoes are vulnerable to reductions in yields and root quality if they receive irregular watering, too little or too much water. Uneven water availability will cause growth cracks, and drought may reduce yields. Too much water also injures sweet potatoes. Storage roots of most cultivars cannot tolerate extended periods of very wet soil due to the lack of oxygen. In saturated soils, lenticels expand becoming more noticeable. These expanded lenticels are sometimes called water blisters. If rainy conditions persist, roots sour and rot. Thus late season rains often reduce yield and quality on poorly drained soils.